"Walk straight to the end of the makeup aisle. Accessorize is in the corner, next to Max Factor, opposite Revlon. ", I said over the phone to Mr.CZ. "Okay, do you see a fuchsia pink thing with gold design? It's right on top of the shelf." Like a Rani (queen), this royal-looking thing was displayed high up on the Accessorize shelf. So gorgeous it looked under the store lights! I'd never seen it before, so I assumed it's a new launch. I reached for it, and took a look inside. 3 chocolates of brow powders, tweezers, brush & mirror....wow, it has it all! I did not see the clear brow wax. I thought "Ooh, looks nice. But no testers....why didn't they keep testers?!! Risk it? Nah, what if the powders are chalky? Remember your disappointment with the Accessorize lipstick? Okay, I'll check out reviews & swatches online, and then come back another day- when I'm back from India. Ya. Bye bye, beautiful!" I got some other stuff and left the store. Text message to Mr.CZ: "*insert cute name I wouldn't call him in front of other people* you going anywhere near Superdrug?" 3 brow powders (light/medium/dark) ~ They are smooth & quite pigmented, although I wish the 2 lighter shades were a little more cool-toned. They referred to the lightest powder as a highlighter, but we can all agree it's too dark for the brow bone. On the brighter side, you could use them all as eyeshadows too. Clear brow wax ~ It does hold up long-ish untrimmed brow hairs and gives a defined arch. Mini tweezers ~ They do their job fine. Mini dual-ended brush ~ Brushes on both ends are the same- angled but a bit to fluffy for eyebrows, I must say. Mirror ~ Always a plus. Price ~ £3.95 (Rs.323) down from £5 (Rs.487) from Superdrug. 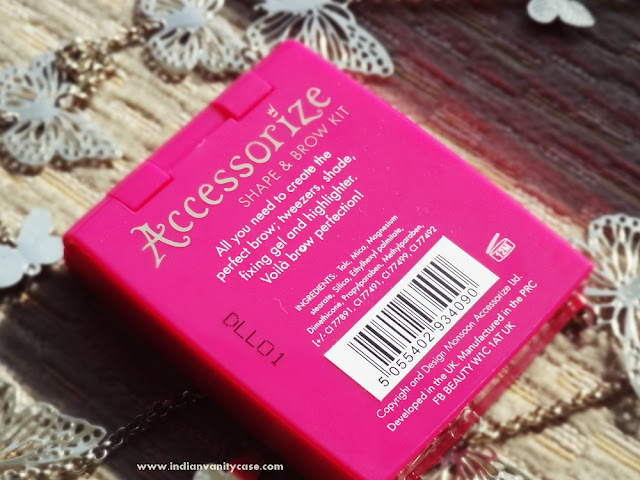 Accessorize Makeup in India ~ I did some googling and saw some products in Jabong & Healthkart, so maybe they'll stock it someday. 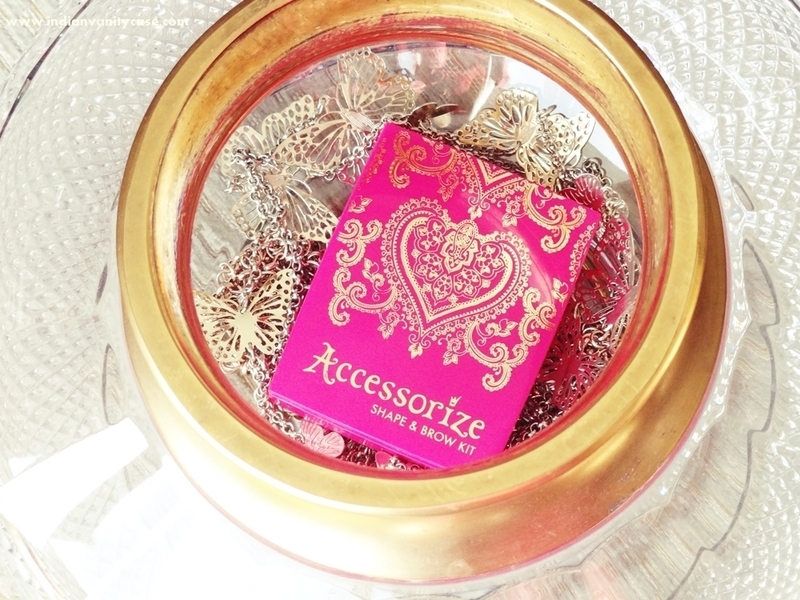 I have never seen Accessorize products in the stores ! hmm wonder when they will start keeping em..
Tho i dint hear many good reviews on this brand. You only got it for the packaging didn't you? hehe.. Looks very pretty though! Oh it has such a pretty box!! And wow you are coming to India? Yay!